We’ve stumbled upon another fabulous fashion app for you to play with—probably everyday. This may replace any outfit dilemmas you encounter on those days where you hit the snooze button more than just a few times (especially on Mondays!). Flip through your clothes easily and view them in beautiful full screen mode. 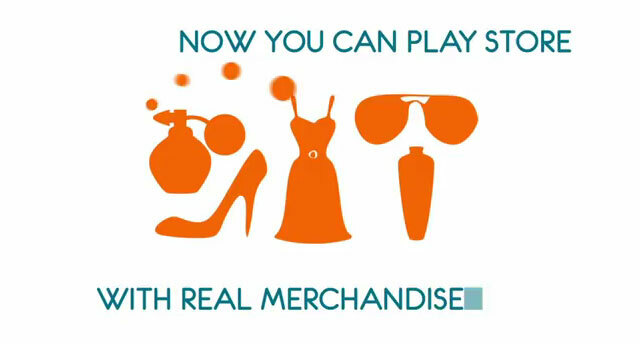 Play around your outfits in a REAL-TIME and INTERACTIVE mode – YOU are your own doll to play dress-up with. With the cutting-edge Image Processing technology, it allows you to remove complex background with simple scratches on your cloth image. Share clothing and outfits with family and friends via email, Facebook, Twitter, etc. to get their valuable feedback. Have you requested an invite to become a Shop My Label Shopkeeper? If not, click here! Jessica Simpson Dream Suitcase Contest powered by Shop My Label – winner announced! In the last weeks, Jessica Simpson held a fab contest called the “Jessica Simpson Dream Suitcase Contest” where fashionistas got to create gorgeous windows adorned with beautiful decor and filled with merchandise from the Jessica Simpson Collection. Sounds familiar? Of course it does! Shop My Label had the amazing opportunity to power the contest with Shop My Label Shopkeeper technology. We were thrilled at this opportunity and so grateful that the team over at the Jessica Simpson Collection entrusted to do this. All the entries looked amazing! The grand prize winner’s window is below, along with the runner up and third prize winners. With Shop My Label being at the forefront of the “social shopping” craze, coming across this new ad campaign for Saks Fifth Avenue sent giddy vibes up and down our spine. Seeing a more traditional luxury department store embrace social media the way Saks has done in this campaign is definitely a sign that social media/shopping is a force to be reckoned with. 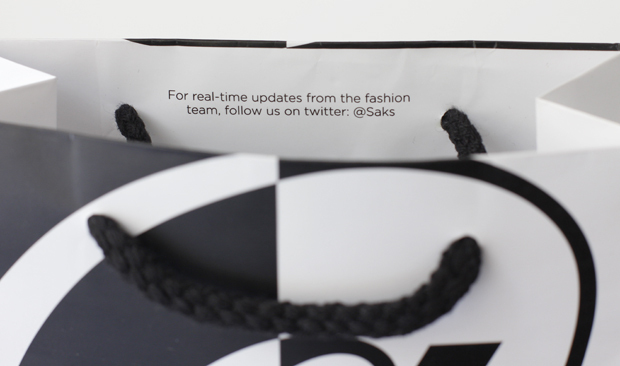 Saks is very active on Twitter and therefore took advantage of their iconic logo and branded shopping bags nobody dares throw away. 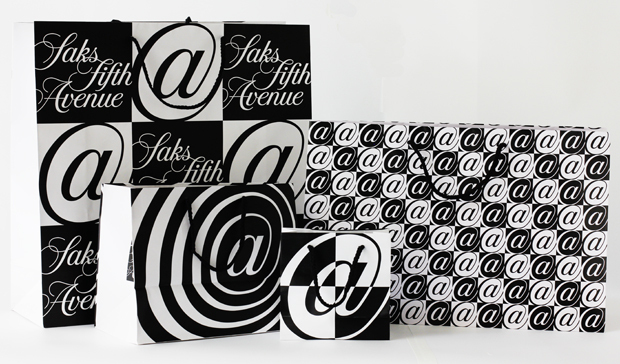 With just one glance a the campaign or shopping bags, you’ll know where to find Saks online, instantly. Fashion lovers adore their brands, fashion lovers are also online–it therefore makes sense for brands to follow their fans and establish themselves online and create social relationships. It clearly works the other way around as well–brand lovers go where their favorite brands go. Shop My Label is the bridge (or runway) for the fashioning individuals who love to shop, inspire their friends to shop, and make money while at it. Saks is one of Shop My Label’s 1000+ brands you’ll have access to for shopping, sharing, and selling to your friends. Have you signed up for an invite? You can view the entire ad campaign over at Pentagram, the firm behind the design of the new Saks brand featuring the @ symbol. Did you ever want to own your very own shop? Are you on social networks like Facebook, Twitter, Tumblr? Do you email? Could you use extra ca-ching (especially just in time for your holiday shopping!)? If your answer to any of these questions is yes, then you have every reason to become a Shop My Label shopkeeper. Imagine decorating the window to your very own shop using gorgeous templates and selling apparel that are made by top brands in fashion and sold in the swankiest department stores–like Saks. Yes, you can actually be a shopkeeper for Saks Fifth Avenue! And the beauty of it all? It doesn’t cost you a dime! We like to think of ourselves as Avon’s lovechild–minus the start-up costs, plus the fab brands. Become a Shop My Label Shopkeeper by requesting an invite here. You get paid! woop woop! Take a look at this short video that talks about becoming a Shop My Label Shopkeeper, it will make it all more real for you. If you have any questions whatsoever, feel free to send over an email (social@shopmylabel.com) or leave a comment on our Facebook page. Either I or one of the co-founders will get back to you ASAP.